A deeply hydrating lip sleeping mask in a game-changing balm-to-oil formula for more nourished and supple lips overnight. Clean, vegan, cruelty free and gluten free. Infused with our chamomile-bergamot dream scent. Yes, please: Vegan, plant-based oils. No thank you: Mineral oil. When it’s time for bed, don’t get between the sheets with petrolatum or fossil fuel-derived ingredients: Instead, cozy up to clean, deeply hydrating plant-based oils and antioxidants for lips that are smoother, softer and more supple when you wake. Our decadent blend of jojoba, sunflower and safflower seed oils comes together in an innovative balm-to-oil lip therapy that starts as a solid but melts onto lips to wrap them in moisture all night long. Agave nectar and pomegranate extract help nourish. And, should you be inclined to actually sleep, our chamomile-bergamot dream scent sends “it’s time to rest” vibes. Agave nectar, our signature ingredient to help soothe and nurture for more kissable lips. Pomegranate extract gives lips an antioxidant boost. Sunflower, safflower and jojoba seed oils come together for the sexiest texture and help seal in moisture all night long. Ingredients: Ricinus Communis (Castor) Seed Oil, Triisostearoyl Polyglyceryl-3 Dimer Dilineolate, Oleic/Linoleic/Linolenic Polyglycerides, Squalane, Glyceryl Rosinate, Hydrogenated Vegetable Oil, Thus Verniciflua Peel Wax/Rhus Verniciflua Peel Cera, Helianthus Annuus (Sunflower) Seed Oil, Phytosteryl Canola Glycerides, Carthamus Tinctorius (Safflower) Seed Oil, Aroma/Flavor, Simmondsia Chinensis (Jojoba) Seed Oil, Phospholipids, Polyglyceryl-3 Diisostearate, Caprylic/Capric Triglyceride, Tocopherol, Punica Granatum Flower Extract, Ascorbyl Palmitate Agave Tequilana Leaf Extract, Momordica Grosvenorii Fruit Extract, Chamomilla Recutita (Matricaria) Flower Extract, Tocopheryl Acetate, Limonene, Linalool. Scoop. Scrub. Wipe away. Water optional. Use before applying lipstick, for a smoother-looking finish. 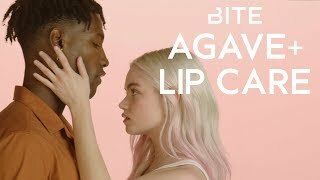 Use before Agave+ Nighttime Lip Therapy, to help hydrate. 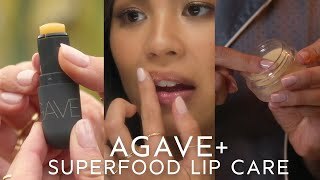 Agave+ Weekly Lip Scrub can also be used to help remove lip color. Smooth. Melt. Sleep. For best results, apply after Agave+ Weekly Lip Scrub. Swipe. Go. Repeat. Reapply throughout the day because you want to, not because you have to.